Everyone is in love with Disney Animation right now. Frozen has melted the hearts of everyone who has seen it. Building off of a revival that began with Princess and the Frog back in 2009, Walt Disney has returned to relevance. They are no longer simply the studio that produces Pixar movies. However, things were not always so wonderful in the House of Mouse. Turn back time ten years and you get what many consider to be the darkest period for Walt Disney Animation. The studio was dying: the ill-fated Home on the Range was about to be released and the name Disney meant “cheap sequel” to everyone who knew them and “another word for Pixar” to those that didn’t. In short: not great. The studio just wasn’t producing hits anymore. Even the surprising Lilo & Stitch wasn’t enough to turn things around. 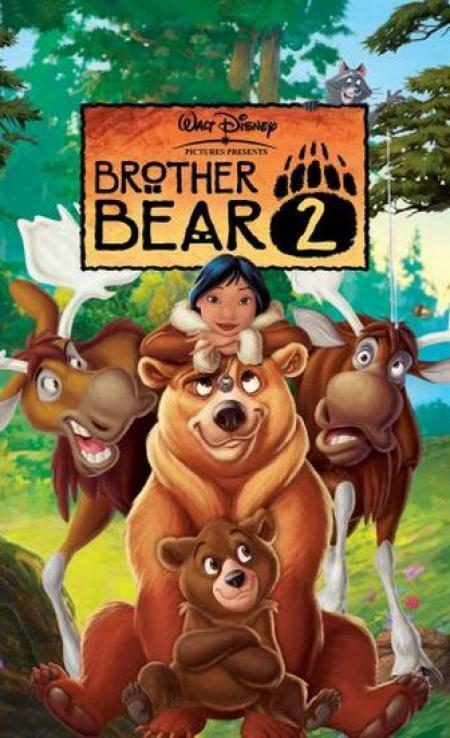 When Brother Bear was released in 2003, it was to mediocre reviews. The film was seen and forgotten. Today when people list the Disney Classics, Brother Bear is not a film on anyone’s lips. And that’s a shame. Not because I think the film was a classic (NOPE) but because it was close to being something really special. Let’s start with the good: the story. The dramatic conflict in this film had incredible potential. Kenai (voiced by Joaquin Phoenix) is unique among Disney protagonists. Remember in The Lion King, when Simba thought he was responsible for his father’s death (spoilers)? Well Kenai actually is responsible for the deaths of his loved ones. How is that for a flawed protagonist? 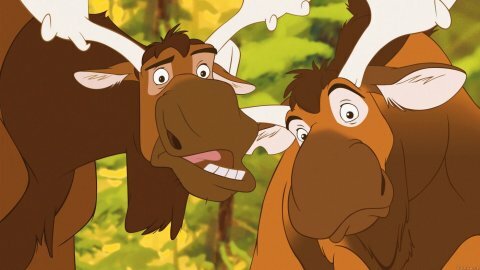 The tragic event that claims his older brother’s life in the beginning of the film results directly from Kenai’s childish nature and then inability to accept responsibility for his actions. The relationship between the three brothers is believable and part of the film’s strong emotional core. Later on, when Kenai has been bear-ified, he meets a cub named Koda (Jeremy Suarez). Koda is lost, having been separated from his mother. Kenai is lost: having just killed a bear, only to be turned into one by his now-spirit brother. 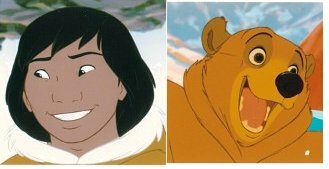 By the way if you think it’s a horrible coincidence that Koda lost his mother at roughly the same time Kenai killed a bear… yeah: flawed protagonist, remember? Kenai’s transformation as a man is what drives the film. The visual change is a nice touch. But this is the triumph of the movie: I didn’t hate Kenai. Functionally he serves as the villain. He is the reason for the setbacks in the movie, for himself, for Koda – pretty much for everyone. Yet these conflicts are not the result of malice but the consequences of a child’s immature actions. Kenai is young and needs to grow up. 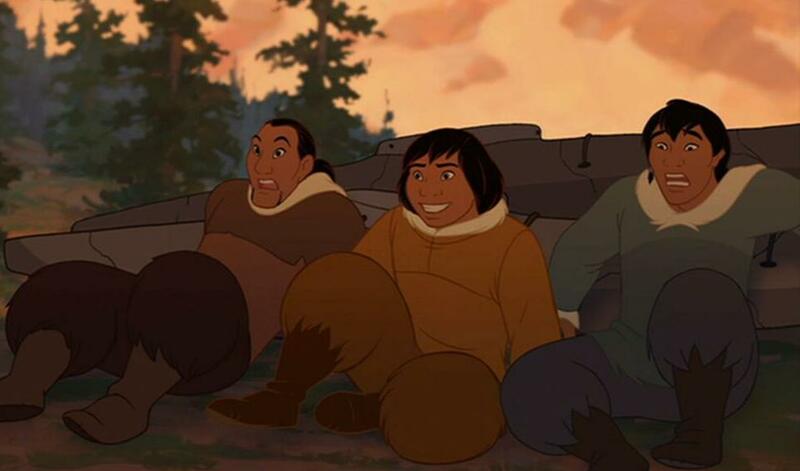 Brother Bear faces the fact that every protagonist is capable of doing the wrong thing. What makes Kenai the hero is how he responds to his actions. I would love to be able to tell you exactly how he responded but… we’ll get to that in the “ugly”. Rutt and Tuke. No I can’t tell you which is which. No, it doesn’t matter. F*cking Phil Collins. 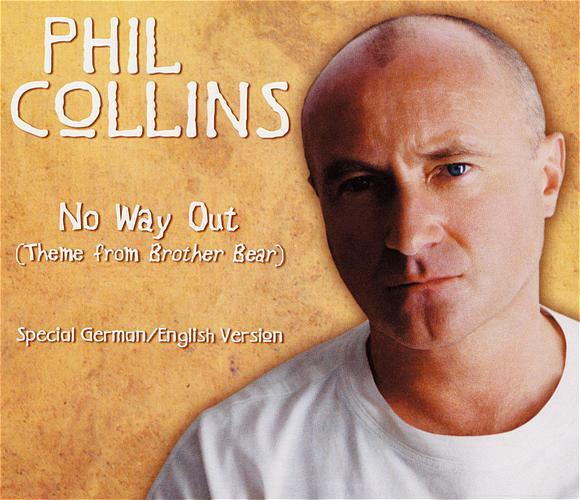 For the record, I don’t usually hate Phil Collins as much as other people. I really enjoyed his songs in Tarzan. But in this: the use of his music single-handedly makes the film noticeably worse. Aside from those written lyrics (which draw attention to the horrendous, ACTUAL lyrics): that is the exact sequence from the movie. There is no consequence, no resolution, just a crappy music number to gloss over every important action in the film. It is impossible to only blame Phil Collins. Someone approved of this. The directors approved of this. There is no dramatic punch in this film, just Phil Collins trying (and failing) to get another Academy Award. I wish I could say that this was the only bad song in the movie but the music is lackluster throughout. Again: shocking for a Disney movie. Could have been so much more satisfying. Yet despite all this: I didn’t hate Brother Bear. It’s fate is, in some ways, far worse than being hated. Hated films earn a place in memory. Brother Bear instead is banished to the nether of average. Eleven years later and it is nearly forgotten. There is nothing really to say about it in the end other than it could have been better, could have been worse. Ouch. Don’t worry, it got a completely unneeded sequel. As I said: these were the times for Disney. I understand the song was a bad part of the film. But I think it was an except able way to communicate to Koda that Kenia had killed his mother. Seriously there’s a problem there, because the music number isn’t strong in any way, but how else can you fit in a movie, without having Kenia sound like a villain, “Koda I’m actually a human that was turned into a bear by my dead brother, and while I was a human I killed your mom.” How does one just casually through that in there? Rutt and Tuke, I wouldn’t say they are compleatly unimportant to the film. Without them Koda would have never realized the sometimes people make mistakes, and that he shouldn’t dwell on the fact that Kenai, in anger, killed his mom, but that he was there for him after she was gone. Without this moment Koda and Kenai’s relationship would have been lost forever. Rutt and Tuke are the embodiment of forgive and forget in this movie.